In the chart above, Residential Market Activity, we can see that the hot areas in Hamilton remain the same as they did last month. Those areas are Hamilton Mountain with 154 sales and Stoney Creek with 104 sales. 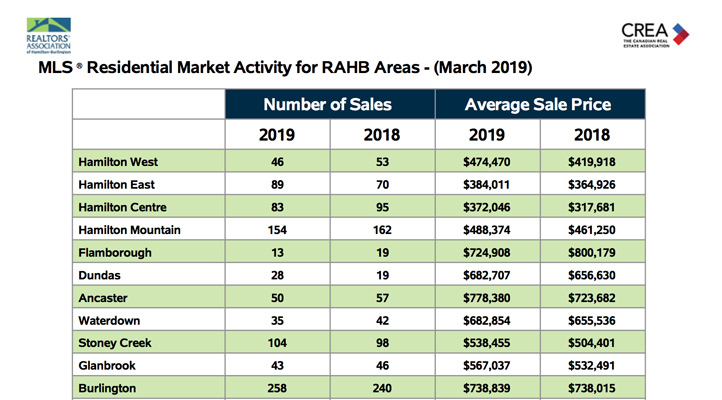 Other areas to note are Hamilton East with 89 sales and Hamilton Centre with 83 sales for March 2019. You are also able to compare each area with March 2018 and see how they have increased or decreased. 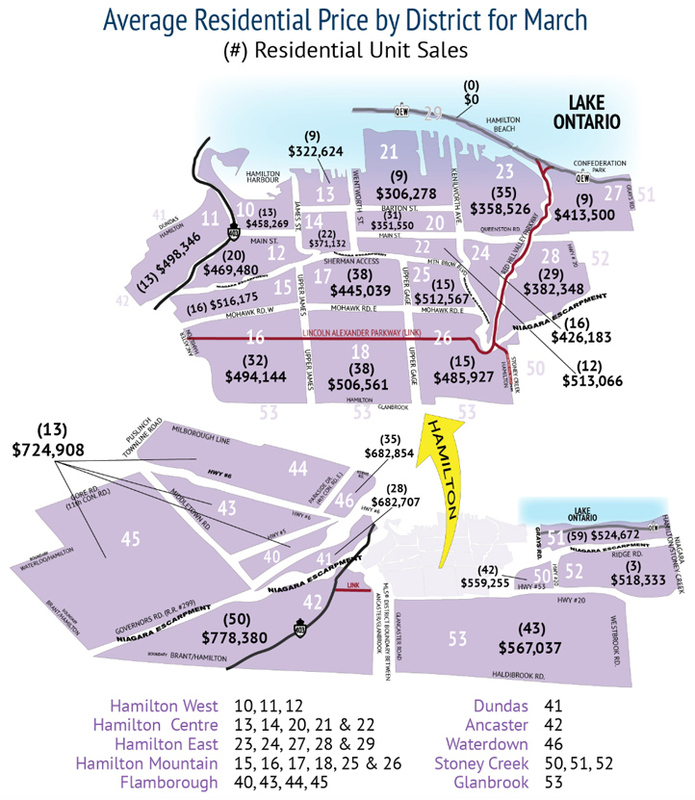 The above map, Average Residential Price by District, we get a great overview of Hamilton. We can see the average price of a property in each area. From the Bay to the Escarpment we can see that March 2019 was a strong (sub areas 16, 18, 20, 42, 53). And we can see that Flamborough and Ancaster remain the areas with the highest costing properties (sub areas 40, 42, 43, 44, 45). Finally we have the Hamilton Residential Table, indicating to us that Hamilton has done very well for the month of March 2019. New listings increased by 4% with a total of 1,108 new listings. The average days a property was on the market was 17 days, only a small increase compared to the same time last year. And the average cost of a property was $519,309 a 6% increase from the same time last year. There was also a total of 649 sales, this was only slightly less than March 2018 with a difference of only 2%. In March 2019 there was only a 1% drop and a 40% increase over February 2019. And there was a 74% increase over January 2019. We saw the average cost of a home increase by 4% to $575,099 from March 2018. Are you considering selling your home? You should get in touch with one of our sales representatives. They will be happy to go over the market stats with you and discuss possible next steps. And if you're wondering what your home is worth, try our what's my home worth calculator.